The weather has been mostly cool and beautiful since the December Warm Period is over. Every December we get a couple of weeks of hot, damp awful weather and everyone starts talking about climate change and doomsday and turns on the AC. I just plan to start all my eggplants and tomatoes and peppers those two weeks – not to make light of that sort of thing, but it IS one of the more reliable weather patterns we still have in these days of change. The nights have been frosty and clear, and full of starlight and the ghostly glow of foxfire nestled in the dry grass under the pine trees. Usually I love the long, restful nights lit with gentle firelight of this season, but lately I have had trouble sleeping. There’s no worse rest than laying awake with the dark minutes ticking by and your mind racing from one thing to another, the endless to-do lists, the regrets of things not done or done right, things that must be remembered…. Last night I lay feeling crushed down by everything i wanted to get done this week, and I finally realized it’s just too much. In the excitement of starting things fresh, I took on far more than i can actually carry already. In other words, I badly needed a good, ruthless frost to come along and nip out all the weak ideas and plans I’ve made. When you’re a grown up (and for some people as a child) there is no watchful mother to make you rest when you’ve done too much, insist you eat something healthy, or make you put on a sweater. You have to figure it out yourself, and sometimes that means stumbling through your days until you realize you’re an idiot to think you can do everything at once. As soon as i realized, i got up and wrote out a NOT-do list (instead of the usual TO-do list), and immediately fell asleep and woke up late. Really, what is worth living about life if you can’t pause and enjoy the little things? What good is all the hard work if you can’t spare the time to savor the blessings that come from it? I want to have time to paint with water colors with my daughters, enjoy the flowers, watch the sunset and laugh. All day today I’ve felt the little sun beams of relief to be unburdened. And these lovely Calamondins have brightened up my whole week! A couple of weeks ago i dug up my one and only surviving turmeric plant and was amazed at how much turmeric it had made. The color is so bright and pretty, and the flavor quite different than the dried spice. It’s like sun beams grown into a plant. This was a fun and easy dinner and turned out so pretty with a little salad of fresh chard and spinach from the garden. 1. Lay the loin in a glass pan and sprinkle with salt, pepper and garlic powder. 2. Cut Calamondins in half and squeeze juice onto the loin. 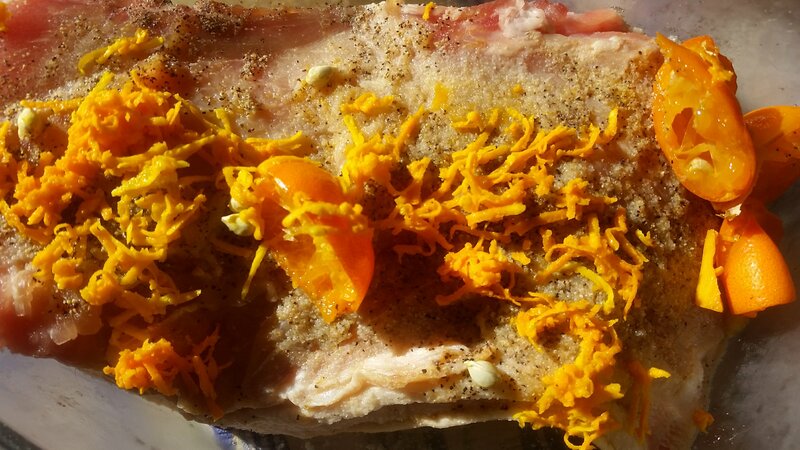 Peel and grate the turmeric, and sprinkle on top. Drizzle all over with honey and leave in the fridge overnight to marinate. 3. I’m afraid i don’t really know how the standard grill works, so I’m not sure how you are supposed to heat it up, but i imagine you would do that first. I just make a good fire in the old wood stove we have, and when there seems to be a lot of coals I pull off the top lid of the fire box and put a grill on top. Heat grill to medium hot? That sounds grilly. 4. Slice up loin and lay on a hot grill. Pour a spoonful of the juice from the bottom of the glass pan on each slice while it is grilling. I also put the calamondin halves on the grill, which made an interesting and tangy condiment. When the meat looks a little toasty, take it off the grill and serve. Now take a breath, prop up your feet, and enjoy. Yummy recipe! I like you endeavour not to do list. I’ve recently come I to a transition where i.essentially starting with a clean slate, and I have so many ideas that I don’t know where to start! Making a reverse to-do list might be quite helpful! Your Not To Do list is a brilliant idea! We all need to write one regularly – and to look through the old ones to make sure that none of that slips back into To Do lists!